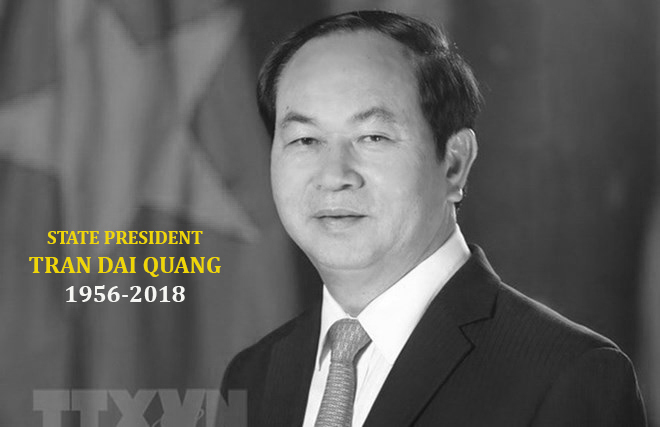 Vietnam will hold State Funeral for State President Tran Dai Quang from September 26-27, according to a special announcement released on Sunday. A ceremony to pay tribute to the late State President will begin at 7:00 am on September 26 at the National Funeral Home at No.5 Le Thanh Tong Street in Hanoi where his remains are preserved. It was followed by a memorial service at the hall at 7:00 am on September 27. The burial ceremony is scheduled at 15:30 am the same day in his home town – Kim Son District Cemetery, Ninh Binh province. The tribute-paying and memorial ceremonies will take place at Thong Nhat Hall in Ho Chi Minh City and Kim Son District People’s Committee in Ninh Binh at the same time with those in Hanoi. The Vietnam Television (VTV) and the Voice of Vietnam (VOV) will broadcast these ceremonies live. On September 26-27, all State offices and public facilities will fly the national flag at half-mast and all entertainment activities will be stopped. Tran Dai Quang, born on October 12, 1956, died on September 21 at the age of 62 due to illness. He served as Minister of Public Security from 2011-2016 before being promoted to State President of the Socialist Republic of Vietnam since April 2, 2016.